We felt it was time to update our findings around gestational diabetes risk factors and future diagnosis of Type 2 diabetes in the mother and the child following a GD pregnancy. Here are the results from a Google forms survey which was advertised in our Facebook groups and Facebook page in March 2018. Obesity is mentioned in the media a lot with regards to gestational diabetes and there is a stigma attached to GD diagnosis that only obese or unhealthy women get diagnosed. Sadly this means that many women feel it is not necessary to be tested because they are not overweight, or those that are diagnosed feel embarrassed or ashamed that they have caused this complication. We see so many ladies joining our Facebook support group that are not overweight so we wanted to conduct some research from our members around risk factors for diagnosis. Obesity was found to be the biggest risk factor (48%) for gestational diabetes but does not mean you will definitely get gestational diabetes if you are obese. Obesity is the only risk factor that can be impacted by the mother before pregnancy. The rest of the risk factors are genetic or simply cannot be helped and so it could be for this reason that we see so much press around obesity and gestational diabetes risk. It should also be noted, that although a BMI of 30 or more was the biggest risk factor found in our survey of 1,878 women, over half (52%, 977 women) did NOT have a BMI of 30 or more. In this photo you can see Helen at 35 weeks pregnant who often had people commenting how could she have gestational diabetes being so slim, even medical professionals! One consultant said "I don't understand why you were tested, you don't look like you would have GD". Sadly Helen is just one of many who has experienced these kind of comments and confusion. If we have medical professionals with this sort of opinion and presumption then no wonder we are faced with such challenges over gestational diabetes diagnosis! How many women could be going undiagnosed and suffering the consequences of gestational diabetes if we have seen a result of almost 10% of women having none of the noted risk factors? This figure could in reality be much higher as these women are simply not getting screened because in many areas, only women with the above risk factors are screened. It is often the case that we see women being screened in future pregnancies following the birth of previous large baby, or following a birth which was complicated with shoulder dystocia. On reflection, most of the women we see coming to our support group in these future pregnancies very often comment that they feel their previous pregnancy was undiagnosed GD. It is for this reason that we believe that all pregnant women should be screened for gestational diabetes, not just the higher risk groups! This is something that is done in Cambridgeshire and if they can do it successfully, then they can do it everywhere! 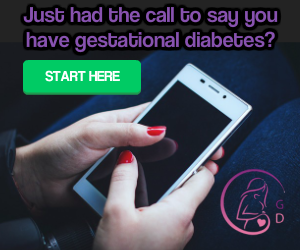 Please help us raise awareness of gestational diabetes and encourage all pregnant women to be screened and at risk women screened earlier by sharing this page. Gestational diabetes increases your risk of developing type 2 diabetes after the pregnancy. Statistics from Diabetes UK state that there is a seven-fold increased risk in women with gestational diabetes developing type 2 diabetes in later life. NICE state that up to 50% of women diagnosed with gestational diabetes develop type 2 diabetes within 5 years of the birth. 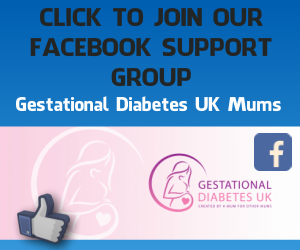 It should be noted that the Gestational Diabetes UK Facebook groups and page have only been running since 2014 and so the results of our survey may show that it is still too early to take too much from these findings as many existing members may have only had their GD pregnancy in the last year or so and NICE suggest the diabetes risk is within 5 years post birth. Why would women be diagnosed with type 1 diabetes following a GD pregnancy? Gestational diabetes diagnosis can be the first time impaired glucose intolerance is diagnosed for those with pre-existing diabetes and so this is why some women diagnosed with gestational diabetes are then diagnosed with type 1 diabetes or with other types of diabetes such as MODY (Maturity Onset Diabetes of the Young). It can also be the first time pre-existing type 2 diabetes is detected. Children born to mothers with diabetes during pregnancy tend to have a greater BMI, raised fasting glucose levels and an increased risk of developing Type 2 diabetes later in life. This is often a surprise to many of our members as they are not aware that a diagnosis of GD has any impact on their baby other than during the pregnancy when the baby is growing in the womb. Bearing in mind that 22 of our mothers answering this survey have been diagnosed with type 1 and other types of diabetes such as MODY, the children that have been diagnosed may have similar predisposed forms of diabetes as opposed to type 2 diabetes. In future surveys we will ask which types of diabetes children have been diagnosed with or are being assessed for to clarify this information further. It is often assumed that the risk of children born to mothers with gestational diabetes becoming obese and/or developing type 2 diabetes is because of diet and lifestyle choices i.e. if the mother was/is overweight and follows a poor diet then the children will be given the same diet, hence will suffer the consequences. Whilst this may be true for many, we definitely see many ladies finding the diagnosis of gestational diabetes a learning curve around diet and lifestyle and often it impacts theirs and their families lives for the better. Nature also plays it part in this for our children though. A baby that has had to over produce insulin in the womb can continue to routinely over produce insulin. As insulin is a growth hormone it can cause obesity. If there is an increased risk of obesity and type 2 diabetes then what can we do? As mother's who have had gestational diabetes we will have learned so much about diet and nutrition. What helps obesity? Diet and exercise. What helps prevent and reverse symptoms of type 2 diabetes? Diet and exercise. By using the knowledge we've learned through our pregnancies we have the power to make a difference! We have a whole page dedicated to preventing type 2 diabetes following a gestational diabetes pregnancy which can be found by looking at this link.